Mr. Madan Saluja is a Management Trainer in soft skills – attitudes and behaviour and an HRD Consultant. He is a Chartered Engineer, with Bachelor's Degree in Engineering from Delhi University and Master's Degree from Leeds University, England. He is the Managing Director of the Cassa Group of Companies engaged in exports of Architectural Reproductions for home and garden products of Victorian Era. Madan Saluja has been the President of Ahmedabad Junior Chamber and Vice-President of Indian Junior Chamber and an accredited National Trainer. 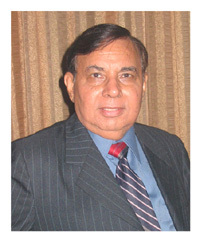 He is a past president of National HRD Network - Ahmedabad Chapter. He is the Executive Committee Member of Ahmedabad Management Association, Indian Institute of Management Consultants, The Institution of Engineers (India) – Gujarat State Centre and the President of Association of British Scholars (ABS), Ahmedabad Chapter. He is a motivational speaker and is invited regularly to speak to students of various management schools, social and voluntary organizations like Junior Chambers, Lions Clubs, Rotary Clubs, local management associations, professional bodies etc. He conducts regularly in-house training programs in soft skills - attitudes and behaviour for corporations and industries in India and overseas for their managers and executives. He also regularly organises inter company training seminars and workshops. Relationship Strategies for Success has been widely accepted not only in India but also in most of the English Speaking countries particularly in USA. A large number of readers – professionals, businessmen, house wives, students and professors - young and old have benefited in improving their personal relationships from this work of social and behavioral science. Several companies in India and USA have ordered this book in bulk for their managers. ‘Be a Lighthouse’ is his unique contribution to the literature of leadership and self-management. His lectures on this subject have been a big draw. Many companies have exposed most of their managers to the concepts of values and ethics as emphasized in this book. Most universities in Gujarat State, India and their associated colleges have invited Mr. Madan Saluja to speak on the subject of ‘To be a Lighthouse’ in their seminars. Many newspapers and professional management magazines have carried highlights of the concept of ‘Lighthouse’ as an apt model for ‘self management leadership’. “Be a Lighthouse” is have been published as a book by “Better Yourself Books” of Bombay. The book should be available in the market.